Liverpool host Porto on Tuesday night looking to make it six consecutive wins in all competitions and with it put one foot into the Champions League semi-final. The Reds may have a psychological advantage heading into the match after dismantling their opponents in the very same competition last season. It was a last-16 match-up during the 2017/18 campaign and many expected it to be a fairly edgy tie with Porto fairly solid under Sergio Conceicao. Boosted Odds for Liverpool vs Porto here – including Salah to score 2 or more goals at 21/4*! However, the rampant Reds clicked into gear in Portugal and ran out 5-0 winners on the night. A Sadio Mane hat-trick was accompanied by strikes from Mohamed Salah and Roberto Firmino. Could a repeat be on the cards? Here’s what we need to be aware of when it comes to Tuesday’s opponents, Porto. Porto have been in imperious form this season and have lost on just four occasions in all competitions. However, they have lost twice in their last 15 games, including a defeat in the first leg of their last-16 tie against Roma. Their other defeat during this block of games came against rivals Benfica. They’ve also drawn four matches during that run but a return of nine victories, including one to overturn the deficit to AS Roma, is an impressive return. A win against Boavista on Friday meant they finished the weekend joint-top of the Primeira Liga with Benfica. Furthermore, In their last 10 matches in all competitions, Porto have averaged 2.3 goals per game while conceding just 0.7 goals. They’re coming into form just at the right time of the season. In the Champions League this term, Porto have lost on just one occasion, the defeat in Rome, while winning six of their other seven games in Europe. 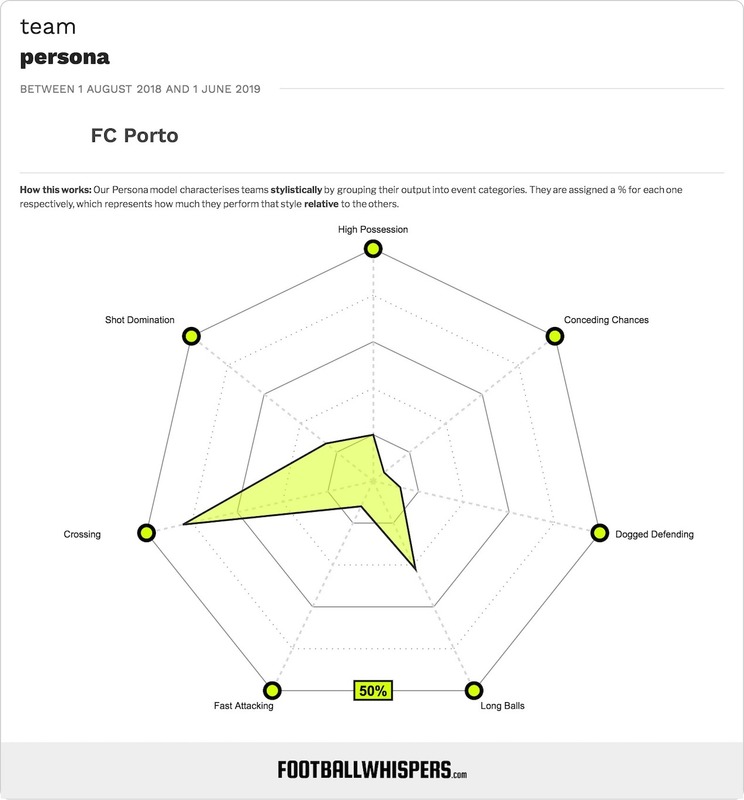 Porto are well organised, extremely disciplined and dangerous in the air. That description makes them sound like a Tony Pulis side but they’re far from just that. They’re aggressive in the press, hunting the ball as soon as it gets to the middle third, and match Liverpool (27) in possessions won in that area of the pitch on a per 90 minute basis. They like to play out from the back, as you would with Pepe and Eder Militao at your disposal, with a lot of the play coming through Hector Herrera. The midfielder averages the most attempted passes in the Porto team (61.17) with a success rate of 83.5 per cent. The Mexico International also wins possession back close to four times on a per 90 average in the middle third showing he’s much more than just a maestro. While all are accomplished ball-players, as soon as they get into the final third they look to move the ball into the channels and task the full-backs, especially Alex Telles, with getting the ball into the area. The Brazilian full-back has six assists this season with only Jesus Corona (8) managing more. In fact, four of their last ten goals in all competitions have been headers. The danger man for the away side on Tuesday will be Tiquinho. The Brazilian attacker has 16 in all competitions and has netted four in his last five. He assisted in the first leg against Roma and netted in the second leg. He’ll want to continue his fine form against the Reds at Anfield. Their strengths are also their weakness. As Liverpool fans know, if you don’t have the right players for a specific system it can all crumble on occasion. And while Porto appear confident in possession, not all of their starting XI is as adept when on the ball as others. At times, there are loose touches in the middle third, overhit passes from deep and Iker Casillas can play his defenders into trouble. Sergio Conceicao may decide to be a little more conservative against a Liverpool side who hit his team for five last season. It’d be the right move, too. Pep Guardiola’ called the Reds the best transitional side in world football. If Porto aggressively press then it’s the sort of game Klopp’s men could kill off during a 30-minute blitz. As ever, the midfield battle will be key in deciding who will triumph on the night. Jordan Henderson came off the bench on Friday night to turn the game on its head at St Mary’s. The Liverpool skipper, freed from the deepest midfield role, upped the tempo for the Reds and put in a real captains performance, topping it off with the third goal. He could dictate proceedings on Tuesday. Proficient when in possession, he’s also just as important to Liverpool out of it, as highlighted by his tackles and interceptions stats this season. Herrera is his direct counterpart. He averages fewer passes and his passing accuracy is slightly worse but he does attempt riskier passes and more of his go forward. 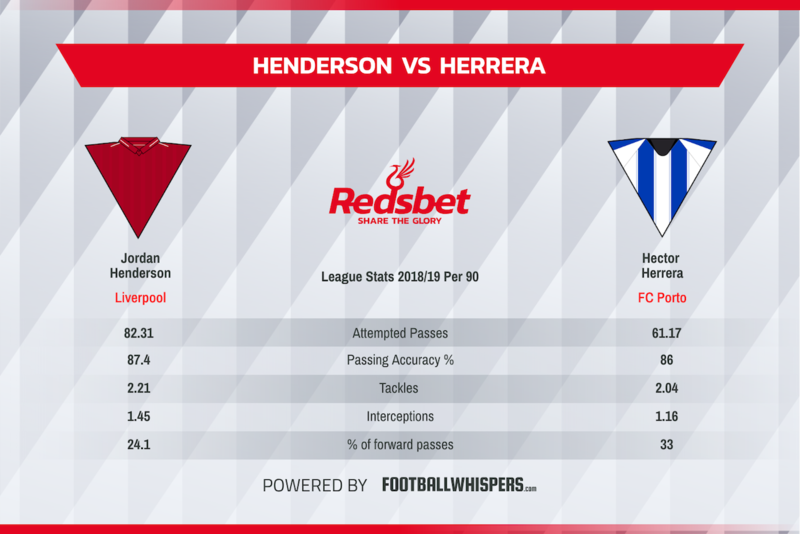 Henderson will want to stop Herrera getting on the ball. Nullify the 28-year-old Mexican and you go a long way to nullifying Conceicao’s charges. Liverpool look formidable as of late. They’re showcasing themselves as the complete team with emphatic victories, come-from-behind wins and late winners. They’re relentless and focused. It’s why the Reds will likely take a victory to Portugal. But the scoreline might be much closer than what it was after the first leg between the two sides last season.